One of the good things of my scholarship in Japan is that I'm making friends from a lot of countries that I never had the chance before. 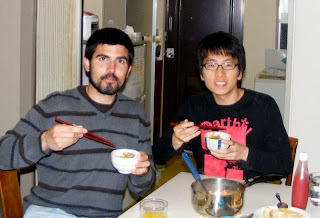 The other day, my Korean friend Daeheon Choi (aka Kevin), invited me to his room to eat a typical dish from Korea called Kimchi Chigae (in Korean 김치찌개). 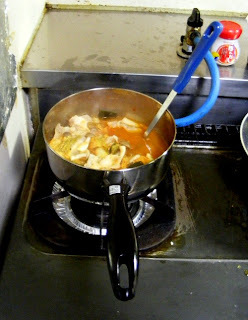 It was very tasty (oishii in Japanese) and I told him he is a good cooker (not like me... yet!). We also enjoyed a good conversation after the dinner. 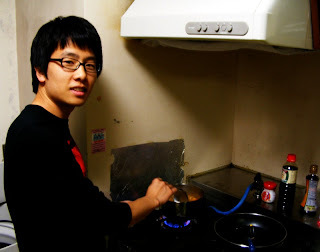 He used to live in Cambridge (England) during a scholarship and he met there a Japanese girl that is nowadays his girlfriend. That was the main reason he decided to study Japanese (he speaks very well and actually, Korean and Japanese are quite similar in grammar) and move here (she lives in Kyoto). He also told me that it was a bit difficult for him to make friends from occident while he was in Cambridge. Then I realized that it was the same for me with Asian people. I have Asian friends but they are not as close as occidental ones. I would like to find out the reasons! Now it is my turn, what Spanish dish should I cook?